Packed with fiber and protein from black beans, these lettuce wrap tacos are a quick and easy light lunch or dinner. This recipe is also completely customizable, so feel free to use a tortilla instead of romaine and/or choose your own toppings! Its a little hard to believe that I haven’t posted a taco recipe yet. We have them for dinner almost weekly because they’re tasty and so simple to prepare. We often switch up the toppings based on what we have on hand or by season. This recipe is completely customizable too, so I encourage you to get creative with toppings/substitutions. I cooked the beans with mushrooms (I like my tacos to have some umami) and then stirred in jalapeño, garlic, and a combo of cumin, coriander, and chili powder. Once the filling was heated through, I spooned it into romaine leaf “shells” and topped them with avocado, fresh cilantro, and an heirloom tomato (so good this time of year). So many options, hooray for tacos! 1-2 jalapeño peppers minced seeds and membranes removed if desired. Heat oil in large pan over medium-high heat. Add mushrooms and beans and cook 4-5 minutes. Add spices, jalapeño pepper(s), and garlic and cook for an additional 3-5 minutes. While taco mixture is cooking, arrange lettuce leaves on a large plate or platter so they are ready to be filled. Divide taco mixture between lettuce and top with tomato, avocado, and fresh cilantro. What’s your favorite way to eat tacos? Tag your photos @gratefulgrazer to share them with me on Instagram! Mushrooms and beans make the perfect tacos! Love the lettuce wraps, so fresh! Thanks, Rebecca! 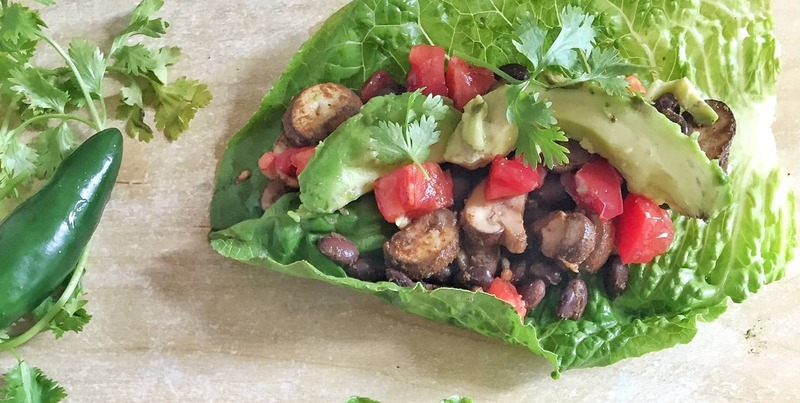 Lettuce wraps are perfect for summer! Love the filling for these tacos, especially the mushrooms…and we have the just about every week too so I’m always up for new ideas! Thanks! Thanks, Marjory! I hope you enjoy this variation! Yay tacos! Tortillas are great but I much prefer using lettuce/greens as wraps during the summer because it is just way too hot. These sound super yummy! Great idea to use the lettuce to wrap up this yummy bundle. Such great colors!